Stardock.net - delivering software at the speed of thought! ControlCenter is the ultimate productivity enhancer. It provides Windows 95/98/NT/2000 with virtual desktops, resource monitoring, program launching, and numerous other features. What really makes ControlCenter stand out is its flexibility. It can be configured almost any way you want. 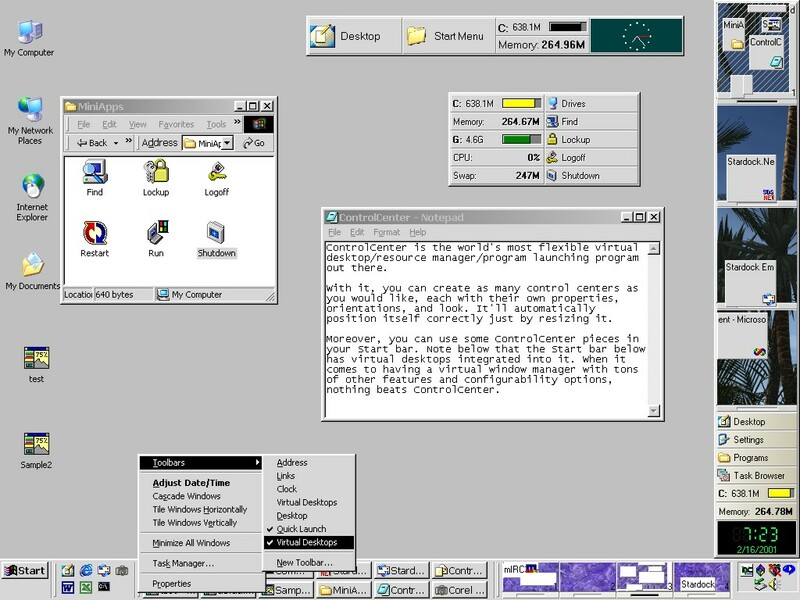 Because of its object oriented design, several uniquely configured ControlCenters can be run at the same time. You can even embed some sections as part of the Windows Start bar! © 1999 Stardock.net, Inc. All rights reserved. Email webmaster@stardock.net if you have questions, comments or suggestions.